A Proper Fry Up – Not Just for Breakfast! Once or twice a year my husband and I drag ourselves out to do some real shopping. Neither of us like shopping and I drag more than he does but it has to be done otherwise we’d wear through our clothes and start getting funny looks. It went as well as it could and we were exhausted by the time we got home yesterday after two days of trying on clothes. Seriously, they really need to make it a better shopping experience. I love Brooks Brothers clothes (from the outlets of course :)) but the sales woman explained to me that they run really small so I should be looking at 4 sizes up. Excuse me? How is that a good marketing plan? She was very nice but I went two doors down to Talbots and found my size that fit. 🙂 It’s times like this where I will freely admit my husband has the patience of a saint because I get really cranky. This is the only time I will admit it though! So to give us some strength for the weekend I thought it would be fun to have a fry up for dinner. For those that don’t know it’s a full English Breakfast. The only thing I didn’t do was the fried bread. I’m trying to be good. Ahem. We have a source for the Irish Bangers, the HP brown sauce, and the Heinz beans. The only thing we don’t have is the English bacon. 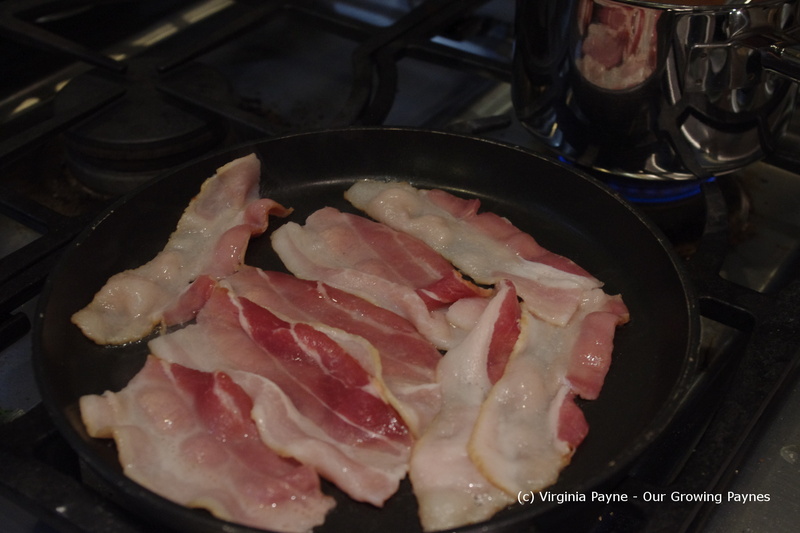 Which I like but not as much as streaky bacon so we were in great shape. This does have to be staged somewhat so it can all be served hot. I start the bacon first as you need the fat for the other components. 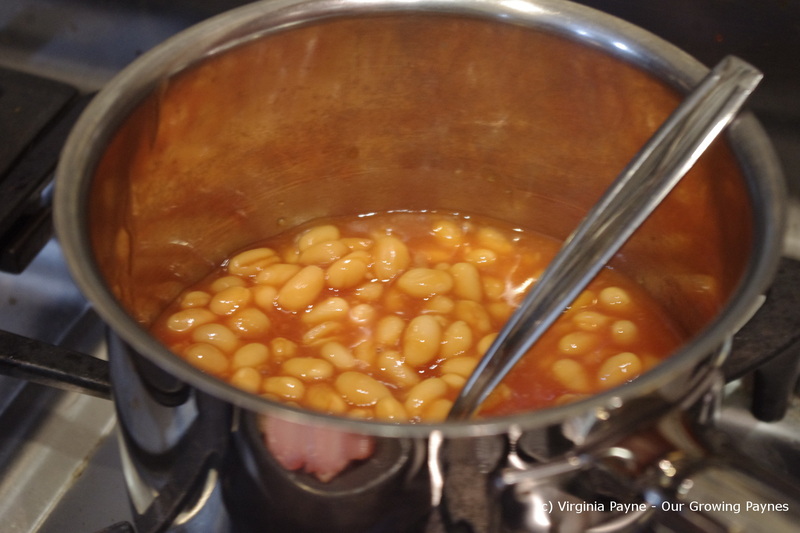 The beans go in a small pot to heat up. It’s important to keep stirring as you go so it doesn’t catch on the bottom. 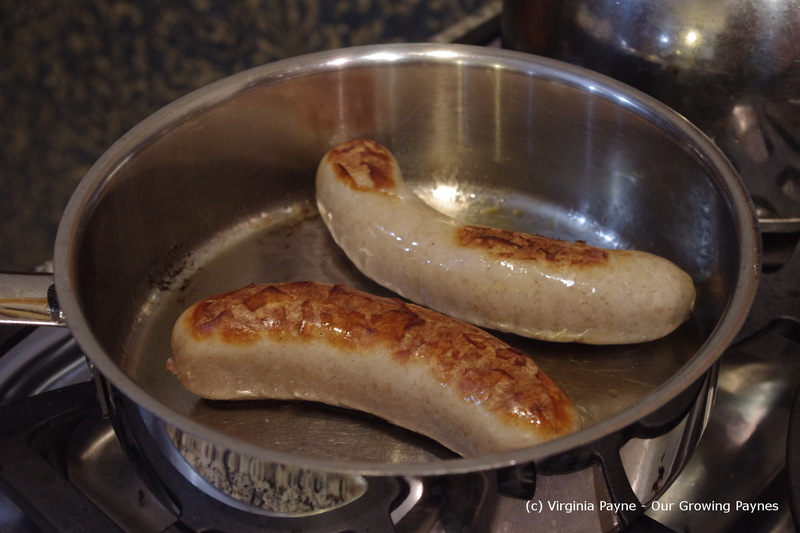 The bangers come fully cooked but they need to be warmed up. These are very thick so I pierce them with a knife and microwave for a minute or so then put them in a skillet with a bit of olive oil to brown them nicely. Once the bacon is done I place it on a warmed plate with paper towels to blot and keep them in a warmed toaster oven. As things finish cooking they join the bacon to keep warm. 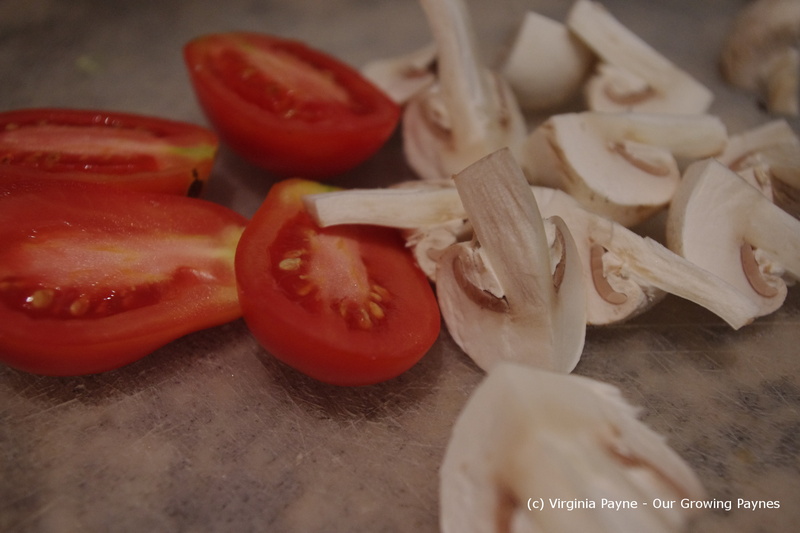 I sliced up some button mushrooms and tomatoes. 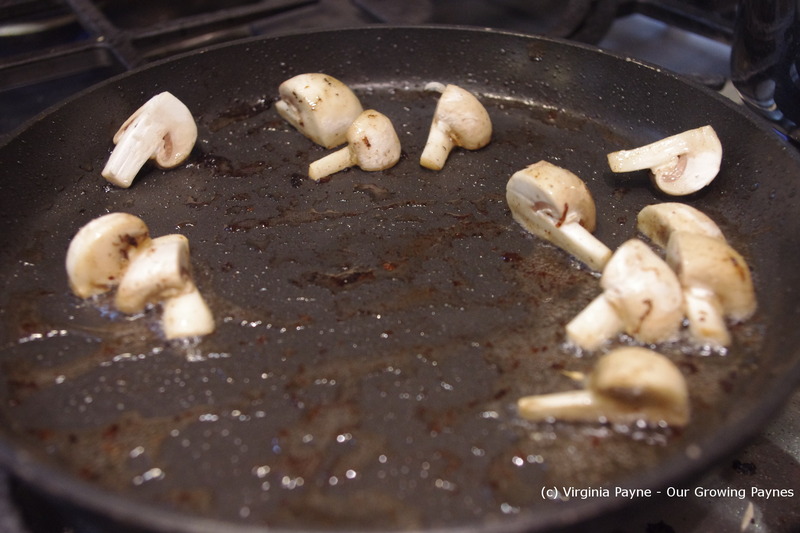 The mushrooms need to cook about halfway before adding the tomatoes. 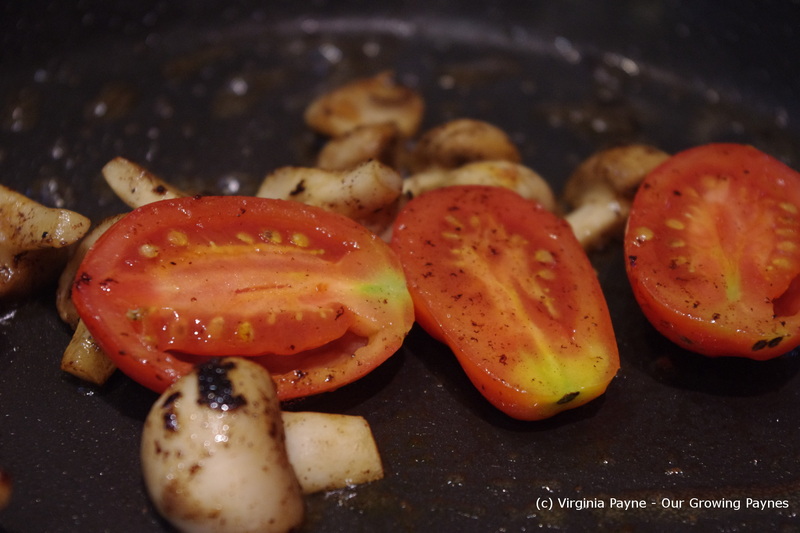 After the mushrooms and the tomatoes are removed from the skillet it is time to fry the eggs. Normally I fry my eggs in fat free cooking spray but not when I do a fry up! 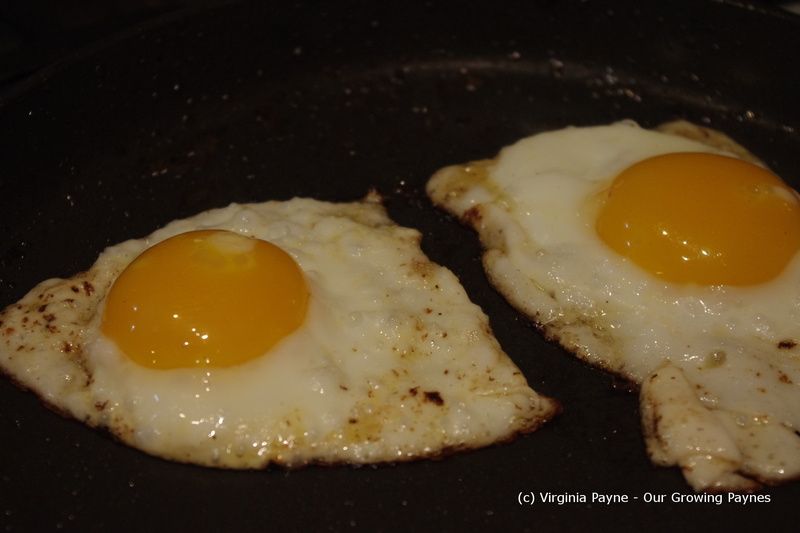 I love the flavour of fried eggs in bacon fat. Just can’t do it very often. Serve everything together and it goes down a treat. This entry was posted in recipes and tagged bacon, bangers, beans, breakfast, cooking, dinner, eggs, food, fry up, full english breakfast, mushrooms, streaky bacon, tomatoes. Bookmark the permalink. 🙂 It really is but can’t have it too often! 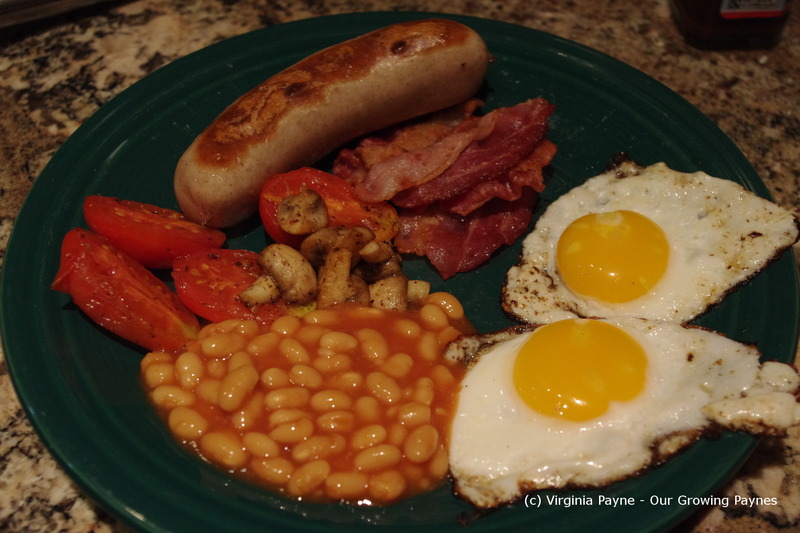 I am an English-breakfast FANATIC. Whenever I am in London (I live in a different country and need to cross the Channel, but it is only an hour and a half away from where I live) I have at least one or two English breakfasts. I like that it is a once in a while thing, but I really should make one at home some day! Yours looks delicious! You’ve done exactly the right thing – who can be bothered to cook that much food for breakfast?! I suppose it’s different if cooking for others as well. For myself I just wouldn’t. I’d have to have siesta straight after 🙂 It’s such a nice dinner! I will have the full breakfast once or twice when I’m in the UK but I can’t have it all the time. Just kills me after awhile. And I get sleepy too! I would really enjoy this breakfast, beans and all. Perhaps it’s because it is so unlike most breakfasts served here but that doesn’t matter. If I see “fry up” on a menu, guaranteed I am going to order it. It’s just too good to pass up. Yeah we were lucky to find the sausages as these aren’t that common over here.